The farmhouse and its contents can be just as important to a farmer as their barns, gardens, farm animals, and fields of crops. It provides a place to rest after a hard day’s work or a front porch to entertain on while sipping on a tall glass of fresh strawberry lemonade. The way it looks and feels depends on the farmer’s “farmhouse style” and reflects many years of wear and tear, mending and fixing, inside and out. Once upon a time, things were made to last. If something was broken, torn, or stained, it was fixed, mended, or scrubbed. Farmers know how to do for themselves and so they rarely just throw something away. Instead, they “make do” and breathe new life into anything, large or small. Most objects around a farmhouse are functional, and have a purpose or special meaning. They have seen many years of birthdays, weddings, and anniversaries come and go while being handled with special care. Many pieces are passed down through generations and treasured as a piece of history. They are considered heirlooms that add memories, culture, and conversation to any kitchen, bedroom, or living area. You don’t have to actually live in a farmhouse or be the lucky recipient of farm-y things in order to get the farmhouse feel. 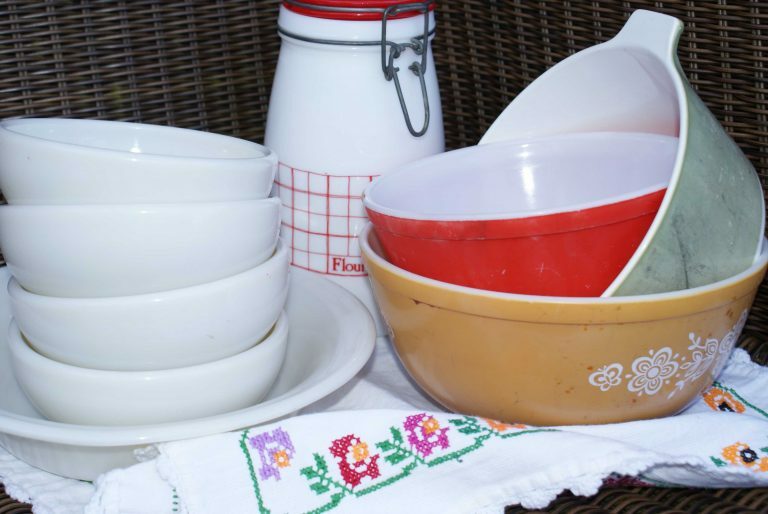 Vintage and antique items can be found in all sorts of places like yard sales, flea markets, antique malls, thrift stores, auctions, bazaars, estate sales, and even off the side of a rural country road. 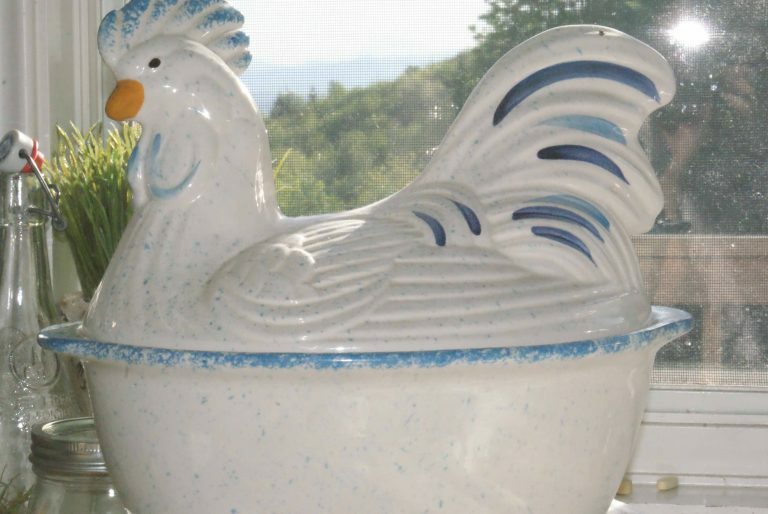 We gathered some of our very own farmhouse vintage items to share with you. 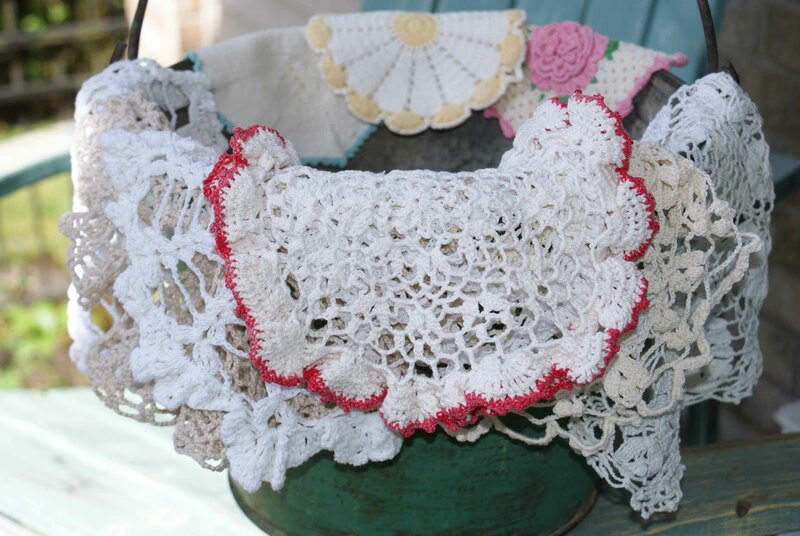 Vintage crocheted dollies come in all sorts of sizes, shapes and colors. They are commonly used to set things on and decorate with. You can even stitch them together to make a table runner. 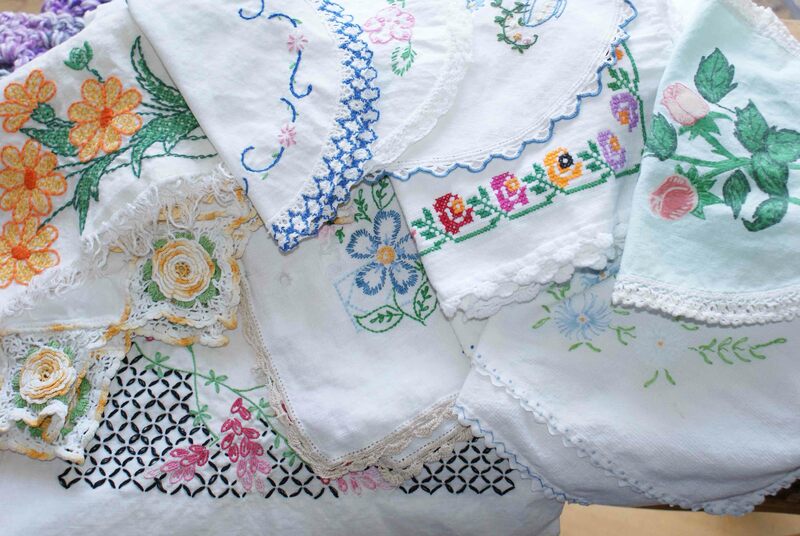 The traditional art of embroidery uses simple to intricate stitches to put a finishing touch on many things such as pillow cases, kitchen towels, and table runners. 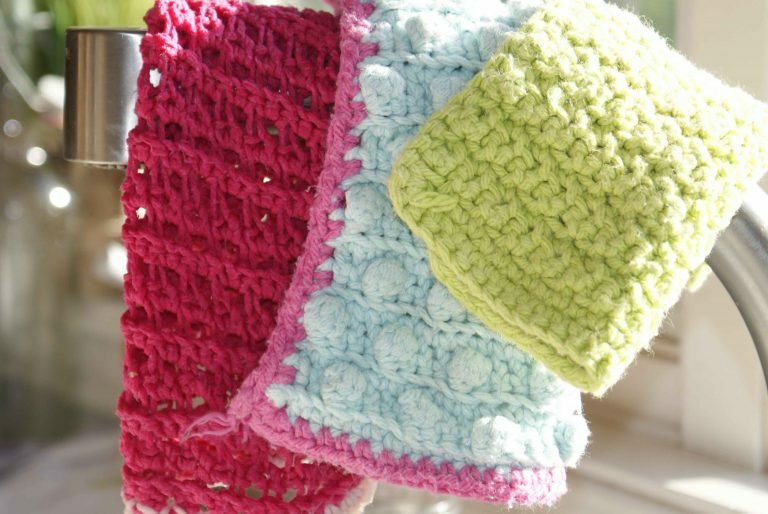 These hand-crocheted wash cloths were made from a pattern that was taught and handed down through three generations of farmers. The turquoise one is our favorite. CorningWare and Pyrex bowls, introduced in the 1950’s, were very popular for their glass-ceramic innovation, which allowed for both oven and stove top use. 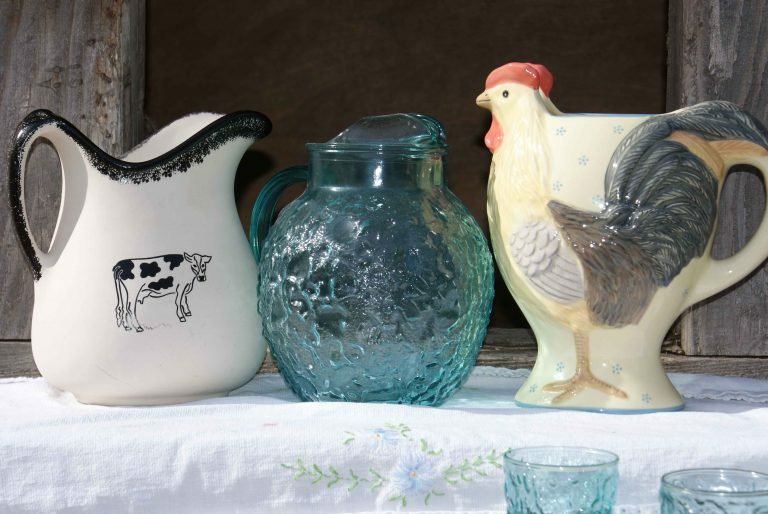 Decorative pitchers used to serve milk, lemonade, or orange juice are a farmhouse tradition. 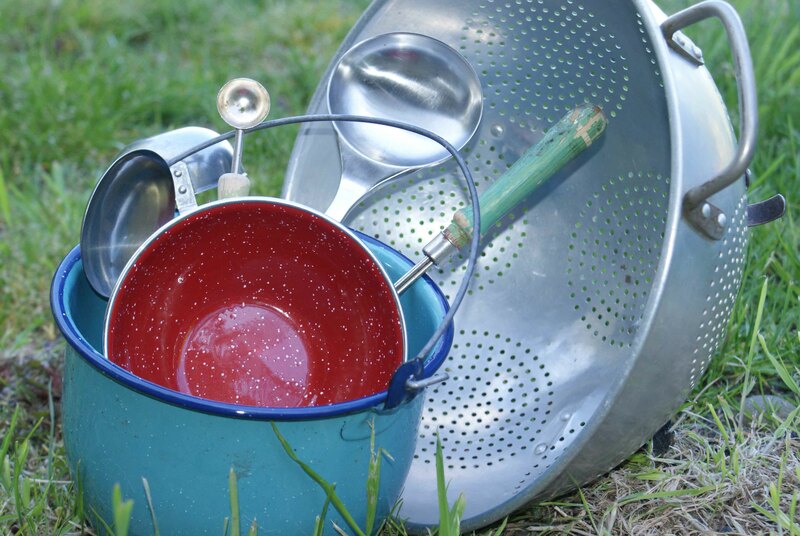 A big farmhouse strainer washes fruits and vegetables from the garden. We love ours so much that we mended its broken leg. Enamelware dates all the way back to the 1800’s and was invented to take the metallic taste and rust out of cooking from iron pots. Old ladles with worn out handles are a nice addition to any farmhouse kitchen. Well-used rolling pins made out of cherry, maple, and walnut hardwoods conjure up sweet memories for many of us. Our mothers, their mothers, and our great-grandmothers rolled out the dough for an old-fashioned berry or cream pie in no time. Crocks come in various sizes and can be used to ferment just about anything, such as sauerkraut, dill pickles, or wine. 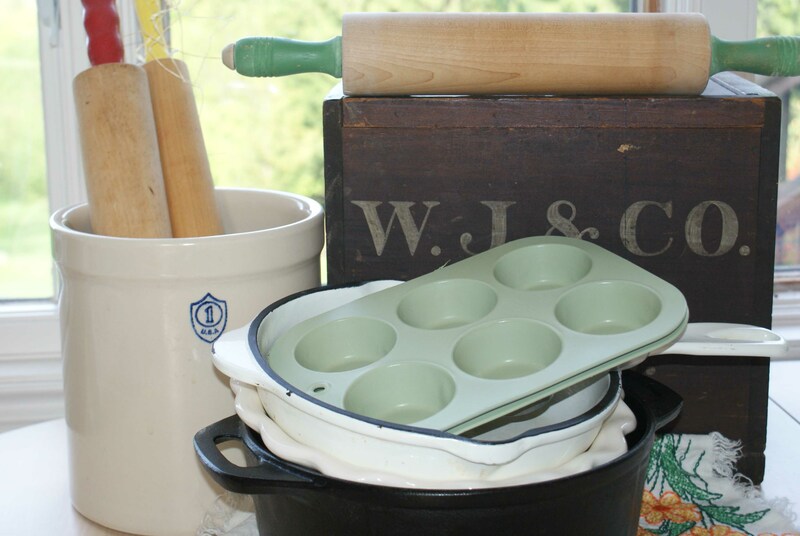 And our vintage ovenware, bakeware, and cast iron pot have cooked up some mighty tasty muffins, breads, and casseroles when put to proper use. 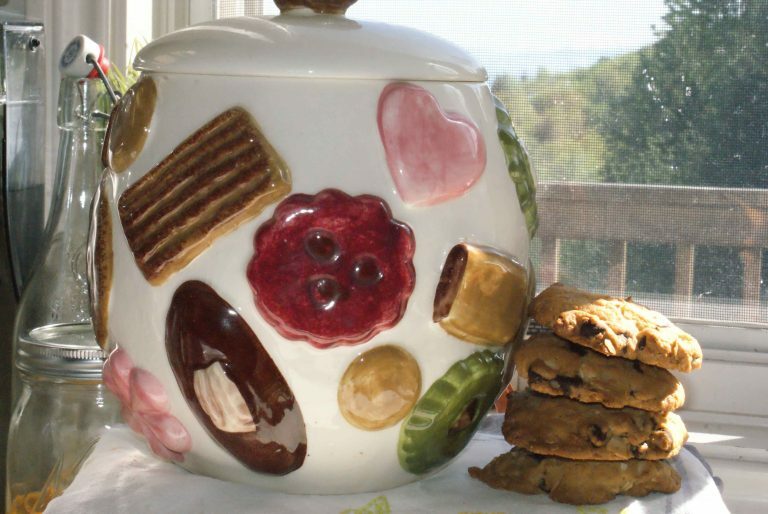 Cookie jars originated in 18th century England as “biscuit jars” and made their way to America around the turn of the century. They reached peak popularity during the 1940s-1970s. Our homemade “farmgirl” cookies only last for a day or two when put in one. Have you ever ladled soup from an old fashioned ceramic chicken? It could entice any kid to eat bean or garden vegetable soup (never their favorite). 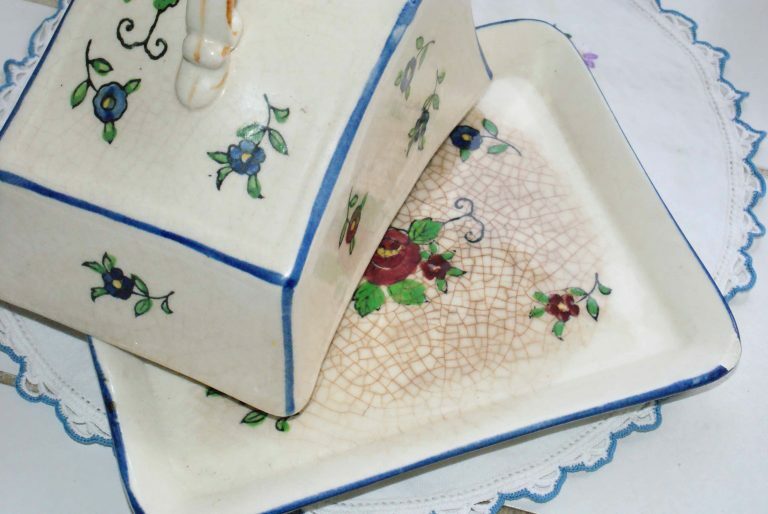 This butter dish is very old and has been used to keep butter fresh and spreadable, without refrigeration, for many years. 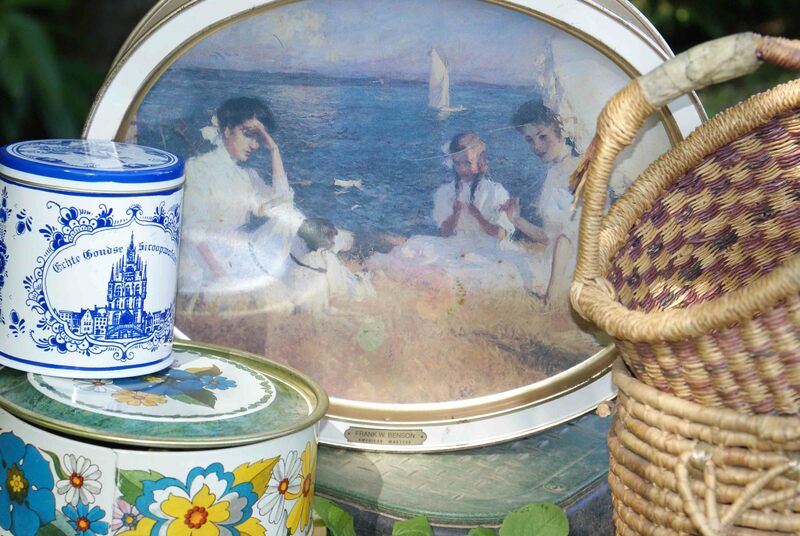 Tins were originally made in the early 1800’s as a sanitary packaging solution for food such as coffee, peanut butter, oysters, spices, and cookies. Branding became important and companies started coming up with all sorts of clever advertising. Some of these are highly collectible. Old baskets are always a handy farmhouse item to have around. We use ours to collect eggs and store sewing materials in. The apron became an everyday household item in the 1930’s. It has been worn by many farmers to carry eggs, kindling for the fire, or fruits and vegetables. It is practical, but can also be frilly and floral. 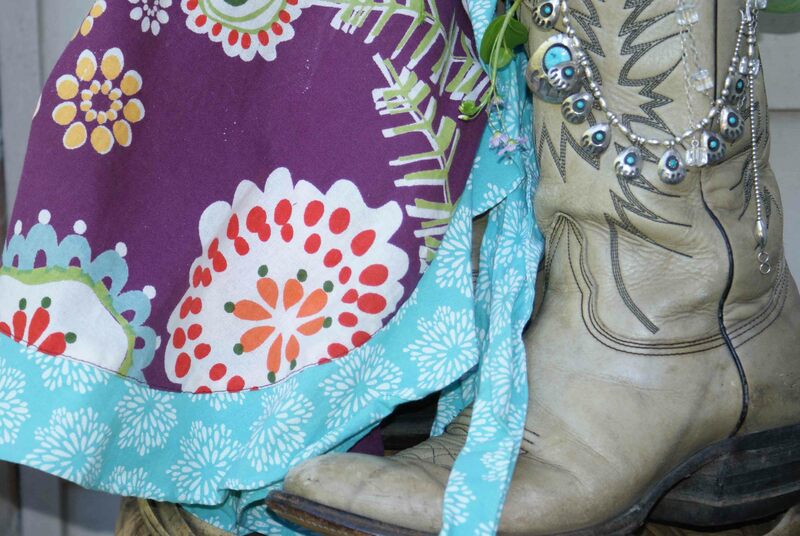 Why not put on a pair of vintage boots and a necklace to snazzy up your daily household routine? Guaranteed to make it more fun! “Farmhouse” has become a trendy, popular decorating style that has evolved to define and capture many identifiable looks over the years. Decorating in this way gives any room a warm, comfortable and cozy feeling. Add some old, vintage pieces and you have instant nostalgia for “simpler times gone by.” Which style speaks to you? What pieces have been passed down in your family through the generations? Have you picked up any farmhouse vintage “one of kind” finds lately? Please share your stories. Previous Post Have You Ever Met a Wild Dandelion?